Its venom is reported to be 15 times stronger than a rattlesnake's. In humans, Black Widow bites can bring on nausea, muscle aches, and make breathing difficult for those who do not respect the ruby-red hourglass warning. 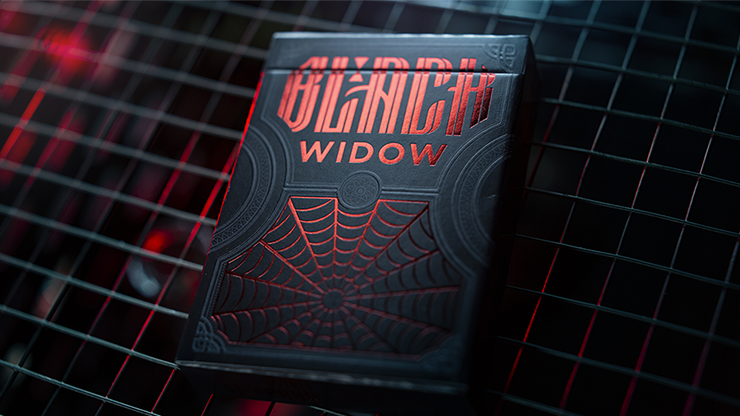 Black Widow Playing Cards is perfect for magicians and cardists who want to capture the attention of their prey. Ensnaring their audiences with its metallic red foil web, and the tell-tale hourglass adorning the card backs. Feel the power as you destroy the custom red fly seal. Let the printing design inside the tuck, surround you... wrap you... with its macabre beauty.